As part of NHL.com's offseason 30 in 30 package, fantasy hockey insiders Matt Cubeta and Pete Jensen will break down each team's fantasy landscape. They will look at the players at the top of the ranks, an undervalued player, an overvalued player, a deep sleeper (players likely ranked outside the top 200 overall players) and the goalie outlook for each NHL team. For the second consecutive season, Staal was a bit of a disappointment to his fantasy owners. 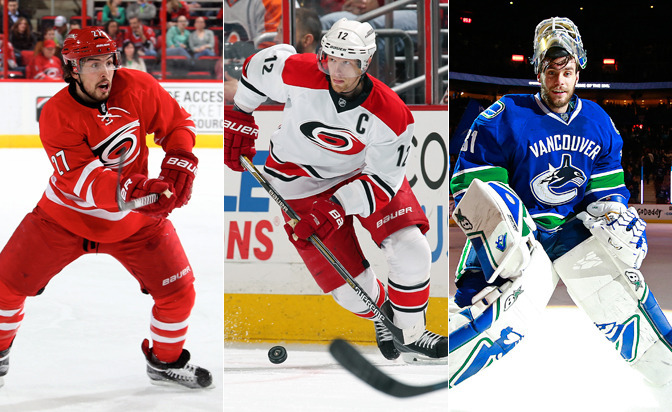 After scoring 61 points in 79 games in 2013-14, Staal regressed with 54 points in 77 games last season. He's 30 years old, so there's reason to believe he can revert back to his old form, but the issue that remains constant is the lack of offensive firepower surrounding him in Carolina. Either way, Staal is capable of being a solid contributor in all categories except plus/minus and should be targeted sometime after round six (he's ranked 75th in my offseason rankings). Below is a list of the fantasy-relevant players in the Carolina Hurricanes organization. These players have been arranged by NHL.com's fantasy staff based on projected value and by position. These players range from top-tier assets to deep sleepers and should be on your radar in standard Yahoo leagues. Faulk joined Erik Karlsson and Brent Burns as the only defensemen to have at least 15 goals, 45 points, 20 power-play points and 225 shots on goal last season. His minus-19 rating hurt his fantasy value but he still finished as the 18th best fantasy defenseman in 2014-15. Faulk has shown steady improvement in each of his four NHL seasons and his 24:25 of ice time per game (16th most in the NHL) shows how much the Hurricanes trust and rely on him. Faulk is a phenomenal No. 2 caliber fantasy defenseman with the potential to evolve into a true No. 1 within the next couple of years. Since scoring 25 goals and 50 points in 62 games (.81 pts/game) in his final season with the Pittsburgh Penguins in 2011-12, Staal has 31 goals and 95 points (.54 pts/game) in 176 games for the Hurricanes. That isn't exactly the type of production fantasy owners were hoping for in Staal's age 24-to-26 seasons. You're best off leaving Staal undrafted and if for some reason he comes out of the gate hot, maybe you try and add him. Don't overpay for his name value though. Lindholm was one of four players to have a five-point game in the League last season (Sidney Crosby, Kris Letang and Anze Kopitar). That says a lot about his talent level, and he's 20 years old. The Swedish born forward finished his first full season with 17 goals and 39 points, including six goals and six assists in his final 21 games. Lindholm could end up on the top line alongside Eric Staal and with his potential, it wouldn't surprise me to see him eclipse 25 goals and 50 points next season. My early guess is that this goaltending situation ends up in a true split by season's end. Ward, the veteran, appeared in 51 games for Carolina last season, and had his best goals-against average (2.40) and save percentage (.910) since 2011-12. Lack, the 27-year-old newcomer, appeared in 41 games for the second straight season with the Vancouver Canucks, and has a 2.43 GAA and .917 save percentage in 82 NHL games. Lack has more potential and Ward carries some injury risk, which is why I've placed Lack higher in my offseason rankings and would advise selecting him before Ward come draft day.